Fr. Eduardo Scarel, O.Carm., during his visit to Dominican, with Sr. Jane Remson, O. 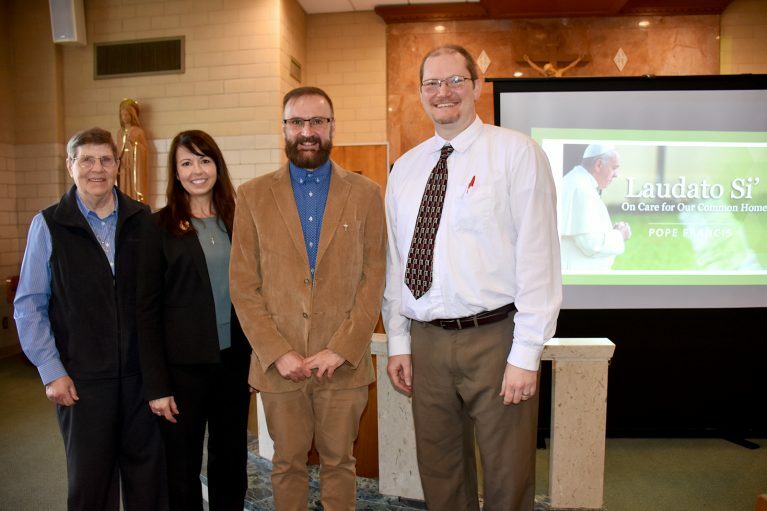 Carm., Main Representative to the Carmelite NGO that has special status with the United Nations’ Economic and Social Council; Jill Cabes, Vice President of Dominican Catholic Identity; and Matthew Foss, Science Department Chair. During a New Orleans visit in March, world-renowned atmospheric scientist Fr. Eduardo Scarel, O. 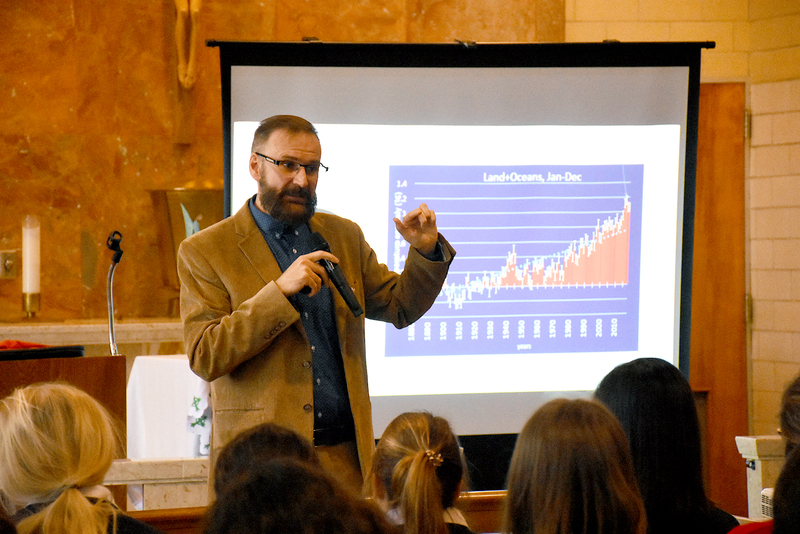 Carm., known as Pope Francis’ climatologist, returned to St. Mary’s Dominican High School for a presentation on climate change and faith. It was Fr. Scarel’s second visit to Dominican. In January 2016, he shared research and insights on climate change and the care of the poor and nature. 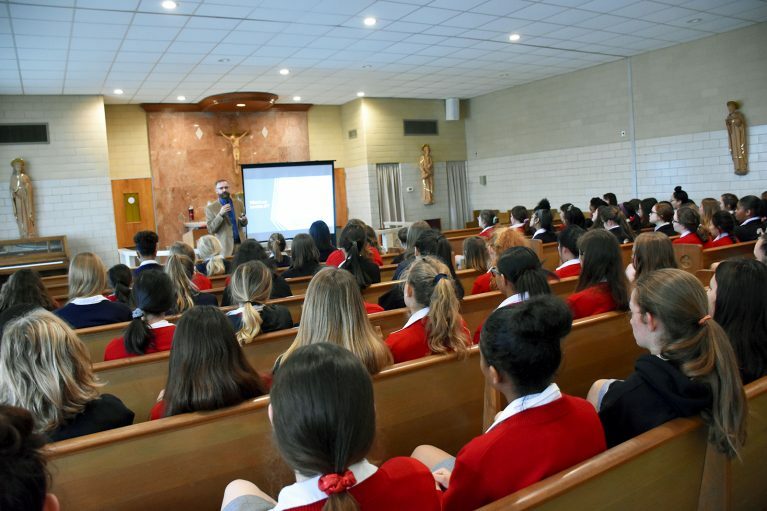 Speaking to Dominican’s biology, history, physics, and religion classes, he spoke on, “Environmental Justice as Seen Through the Lens of Laudato Si’.” Written in 2015 by Pope Francis, Laudato Si’: On Care for Our Common Home, Fr. Scarel noted that it is the first encyclical in church history focused exclusively on care for the environment and nature, and a call for social and environmental justice. The Argentinian priest said his talk was designed to inspire a wide audience – students, academicians, and anyone interested in how faith and scientific issues of climate change intersect. St. Mary’s Dominican High School is a Catholic, college-preparatory school for girls and does not discriminate on the basis of race, color, national or ethnic origin.